MINKPINK’s themed clothes are one of the more diverse offerings as far as types of pieces go. 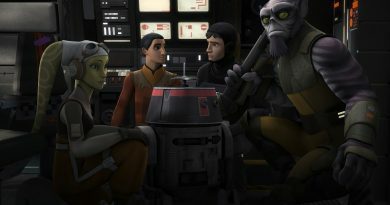 Much of the capsule has a focus on the movie’s enchanted rose balanced with a few cartoon appearances. I’m partial to these True Beauty Rose Scando Jeans ($109.95) and the Belle Signature Dress ($99.95) both of which can be worn as more subtle nods. The ASOS site has a few pieces of the MINKPINK collection as well including this Sweatshirt With Rose Print And Ribbon Cuff Details ($83). Christopher Kane designed a high-end Beauty and the Beast-inspired collection as well. Price range from $275 for a t-shirt to $4,595 for a jacquard coat. So that one is not quite as accessible. Fun Beauty and the Beast footwear is now available from SUPRA. According to Disney/Style, there are men’s, women’s, and children’s sizing, but as of publishing I was only seeing women’s and children’s on the SUPRA website. There’s more jewelry this month too. This time it’s from British jeweler Alex Monroe. Excuse me while I sigh over the detail of his solid sterling silver Enchanted Rose Bud Ring (£126). While the brand is stocked in shops throughout most of the world, this collection appears to be an online-exclusive. 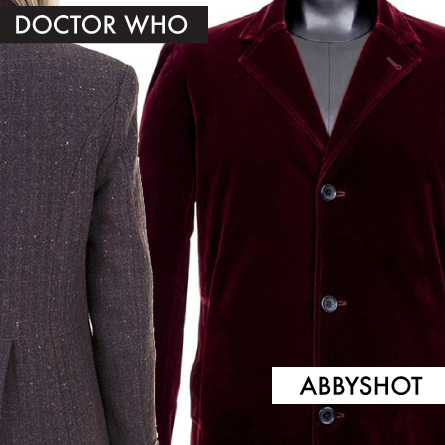 AbbyShot is currently taking pre-orders for their Doctor Who Twelfth Doctor’s Velvet Coat ($249.99). Doctor Who has some pretty good coats and the great thing about AbbyShot’s offerings is not only are they matching fabrics and trims from the actual costume pieces but they also offer both men’s and ladies’ cuts of the coats. I’ve got my eye on the ladies’ version of Eleventh Doctor Purple Coat, which is currently on sale. Check out their blog post for some insight into all the steps needed to bring the coat to the point where it’s ready to ship. Once Upon a Time and Outlander fans might want to check out AbbyShot’s accessories too. 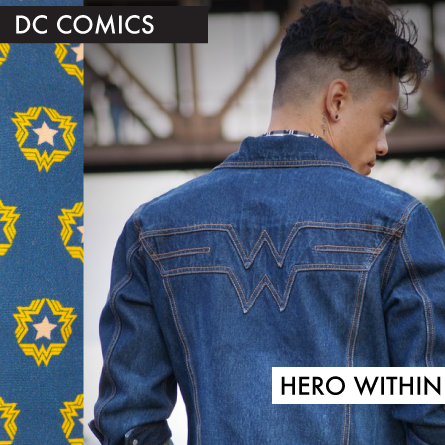 On the DC Comics front, following the release of the Justice League movie trailer, Hero Within has debuted their spring/summer collection online. 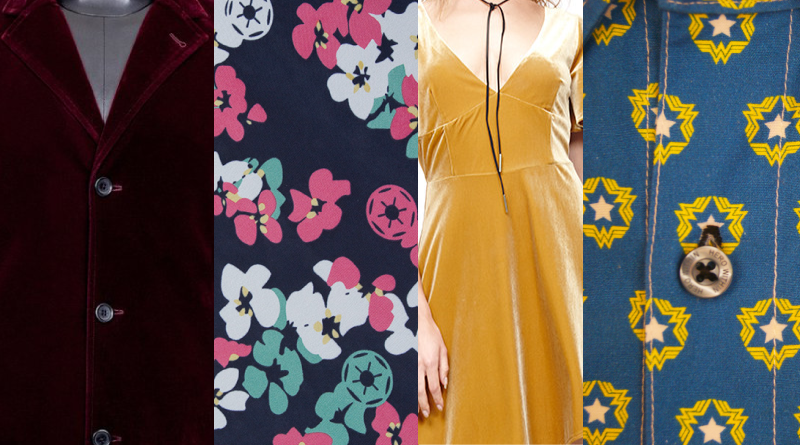 The 4 button-down short-sleeve shirts ($49 retail, $39 pre-order) go the subtle pattern route for the Justice League, Batman, and Wonder Woman. And the Wonder Woman Denim Jacket ($129 retail, $109 pre-order) integrates her logo across the back as well as inside and on the buttons. All 5 new items are expected to ship out by the time the Wonder Woman movie comes out in June. 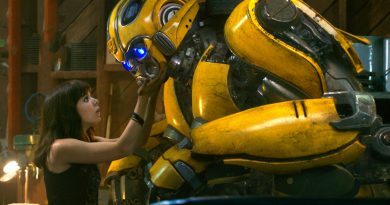 Samples will be available for in-person viewing at WonderCon. Hero Within has also taken customer feedback into account from their first release and will be offering 3XL sizes. Be sure to click over to their homepage to see their fancy, new promo video too. Hopefully there will be even more Wonder Woman apparel in the months ahead. I haven’t gotten to test the functionality of this one, but right now this Wonder Woman Caged-Back Sports Bra ($24.99) from ThinkGeek looks fun and stylish. Something a little different comes in the form of this Fantastic Beasts Newt Scamander Cosplay Bundle ($129.99) from ThinkGeek. It includes a coat, vest, and tie. Wear them all together or wear them separately to add a hint of magic to your everyday outfit. 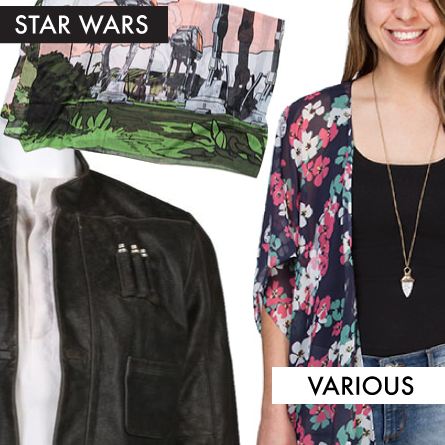 Want to add a Han Solo jacket to your closet instead? Anovos has their version of Han’s The Force Awakens jacket ($500) available for pre-order on its own through April 16th. More pieces for your Star Wars geek fashion wardrobe have appeared at ThinkGeek. Technically this BB-8 Paisley Tie appeared on the last day of February but it was after my posting cut-off so shhhh. ThinkGeek has a few of these subtle geek ties that are a great way to incorporate fandom into business or more formal outfits ($54.99). They also added two new kimono-style wraps: Star Wars Floral and Galactic Empire Kimono Wrap and Star Wars Rebel Alliance Floral Kimono Wrap ($24.99 each). These appear to be rather lightweight and transparent – definitely a subtle spring/summer layer. Meanwhile the Rogue One AT-ACT Sun Walk Scarf $19.99 hangs out somewhere between subtle and bold, depending on how you wear it. WeLoveFine has a new sleeveless patterned blouse for women. It’s called First Order Blouse ($45) even though it has the Rebel firebird on it too. Points for being something a little different though. Star Wars Loungefly bags and Love and Madness accessories can now also be purchased through Her Universe’s online store. Find them in the new Ashley’s Favorite Things section. Her Universe’s first eco-friendly shirt will be a WonderCon exclusive. Jordandené has a neat interview with the woman behind RockLove Jewelry, Allison Hourcade. RockLove is also having a sale right now in honor of Allison’s birthday. Animal-friendly handbag company HARVEYS is launching a Beauty and the Beast collection soon. (h/t Johnamarie Macias) They already have some 101 Dalmations and Alice in Wonderland designs.